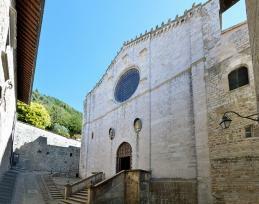 The existing Gubbio Cathedral (Basilika des Heiligen Marian and James Märtyrer) has been built during the last twenty years of the XII century. Above the door at pointed arch there is a marvelous big circular window. At the sides of the window the symbols of the evangelists: the eagle of St.Giovanni, the bull of St.Luca, the lion of St.Marco, the angel of St.Matteo. At the center of the tympanum there is the symbol of St.Giovanni Battista. The inside is a latin cross shape with a single nave. The ceiling is supported by ten pointed archs. Marvelous, the wood Cross above the altar is supposed to be of Umbrian school of the XIII century. In the cathedral there is also the seat of the Diocesano Museum.